When will be Gokusen next episode air date? Is Gokusen renewed or cancelled? Where to countdown Gokusen air dates? Is Gokusen worth watching? 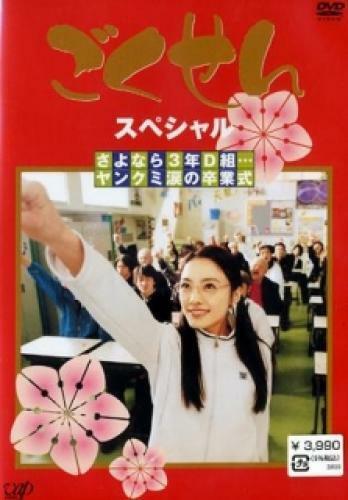 Fresh out of college, Kumiko "Yankumi" Yamaguchi becomes a math teacher at Shirokin high school. Unfortunately for her, she's assigned by the school board as the homeroom teacher for class 3-D, which happens to be the class of delinquent students. When the class attempts to make a living hell out of Yankumi's career, they fail as her persistence and aggression gain her respect. However, little does anyone in the school know that Yankumi is actually heir to the Oedo Group - one of Tokyo's most powerful yakuza clans. If anyone finds out that Yankumi is a yakuza member, her career as a teacher could be in jeopardy. Gokusen next episode air date provides TVMaze for you. EpisoDate.com is your TV show guide to Countdown Gokusen Episode Air Dates and to stay in touch with Gokusen next episode Air Date and your others favorite TV Shows. Add the shows you like to a "Watchlist" and let the site take it from there.